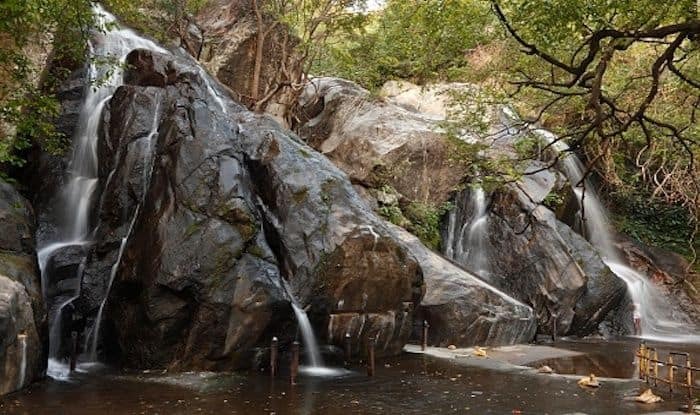 Kovai Kutralam Falls, a Multi-Step Waterfall Nestled Amidst Nature is Worth Visiting. Nestled among the dense woods of Siruvani region in Coimbatore, Kovai Kutralam Falls is an attraction worth visiting, and for good reason. It forms a part of the extension of Western Ghats, and falls from whopping 100 feet that creates a dazzling effect. When water from Siruvani Dam flows down the Siruvani Hills, it ends up in a multi-step waterfall. It’s exceptionally beautiful; due to the dense canopy, the sunlight is restricted here giving it a surreal feel. The lush greenery is also apt for having a compact picnic with your near ones. Although travellers have to vacate the attraction by sundown ( the dense covers are home to many wildlife species), camping in groups is often conducted under supervision. A rather great aspect about this waterfall is that its waters serve as a key source of fresh water to the nearby villages that lack basic amenities. The best time to visit Kovai Kutralam Falls is during March to October. It’s just the right time to rejuvenate your tired senses and spend a good time amidst nature. The only way to reach this beautiful attraction is via a short trek. Since the rural roads are craggy, travellers have to de-board the bus or cab at the village of Kovai and begin the trek from there. It’s adventurous, thrilling and scenic in equal measure and a must for adrenaline junkies. The forest is home to a variety of flora and fauna, and a huge number of colourful birds. Keep an eye out for them and prepare yourself to take some gorgeous photographs home. The waterfall is located under the forest department jurisdiction, and hence you have to obtain permission from the forest office before entering this place. The nearest airport from here is the Coimbatore Airport. Kovai Kutralam Falls is located around 35km from Coimbatore.